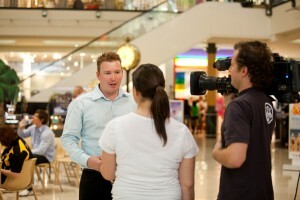 As a local business ourselves, here at The Marketing Mix we like to give back to our local community in any way we can. Every year we attend the National Breast Cancer Foundation charity fund-raising breakfast and we also work for and donate to The Athritis Foundation of WA and Breast Cancer Care WA. We currently sponsor our valued client, Surf Life Saving WA, and this week we presented them with a cheque for $1000. Surf Life Saving WA is a volunteer based not-for-profit community service association committed to saving lives and promoting Australian beach culture. In their words, it protects life, it saves life, it promotes life. Surf Life Saving is Australia’s largest volunteer movement of it’s kind and exists soley through community donations, fundraising and corporate sponsorship. 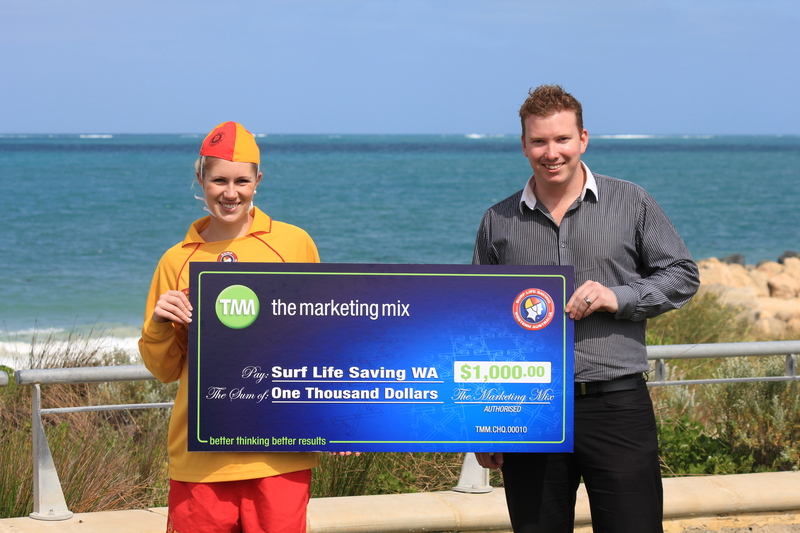 As a Perth company not far from Scarborough Beach, The Marketing Mix have partnered up with Surf Life Saving WA in both a client and corporate sponsor relationship. 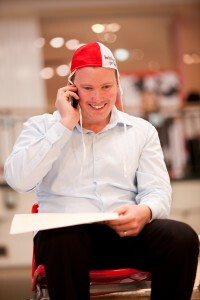 Every year Surf Life Saving WA holds their ‘Up The Tower’ fund raising event, and this year The Marketing Mix sales rep Darren Tardrew took part; and boy did he enjoy himself. Darren will do anything to get out of coffee machine cleaning duty on a Friday afternoon, and this was a pretty good excuse. This year, the Up The Tower was hosted by Karinyup Shopping Centre and the event saw 20 individuals and businesses head up a patrol tower to raise funds for Surf Life Saving WA. Once the participants are ‘Up The Tower’ they have a 20 minute challenge to call friends, collegues and family to try to raise as much money as possible. Surf Life Saving WA’s Marketing Manager Scott Hine said that all the money raised will go to priority areas of need and help fund the work of volunteer surf lifesavers, ensuring WA beaches remain some of the safest in the world. Local Surf Life Saving clubs were also out in force throughout the centre over the weekend as volunteer surf lifesavers shook collection tins to raise over $8,000 for the clubs. The event was hosted by Postcards WA presenter Pip O’Connell and featured summer fashion parades, giveaways and live entertainment. The event was also supported by Perth Wildcats star Matthew Knight who signed autographs and made some fund raising phone calls.If you want to get involved with Surf Life Saving WA like us, then visit their website and find out how. Oh, and yes we do giant novelty cheques, so talk to us if you need one of those!